A long, high-ceilinged room with views over the Hofvijver. Heavy curtains hang in front of the windows and glittering chandeliers are suspended from the ceiling. The walls are hung from top to bottom with paintings. 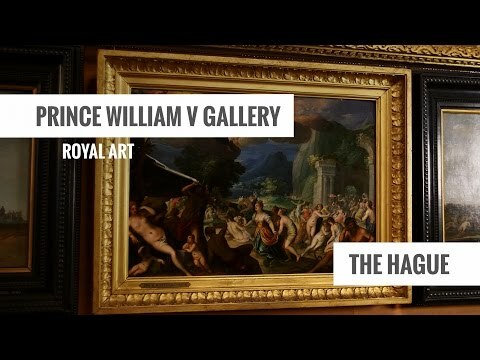 Extravagance and luxury: these are the defining features of the Prince William V Gallery. Around 150 paintings hang in the Gallery. They are mainly by Dutch and Flemish masters such as Steen, Potter, van Mieris, van Honthorst and Rubens. Together they give an impression of Stadholder William V’s eighteenth-century collection of paintings. And of the splendour and luxury of a royal collection. A warm summer’s day. A female figure milks her cows in the shade, while a group of men and boys cool off in the water. Some of the cows have also headed for the water, where they are reflected in the smooth mirror-like surface that Paulus Potter has created. William V purchased this small painting at the auction of the Slingelandt collection in 1768, having earlier inherited Potter’s famous bull from his father. The prince and his contemporaries were charmed by the meticulous style and everyday details of Potter’s paintings. The appeal of this painting, however, would have been above all in the idyll of summer country life, a life of which the prince could only dream. Collecting was an unspoken obligation for an eighteenth-century ruler. This was true for the young Stadholder William V too. In addition to paintings by Dutch and Flemish masters of the Golden Age, the prince also collected antiquities, coins, stones, fossils, books and even animals. His collections form the basis of many museums and libraries in the Netherlands.